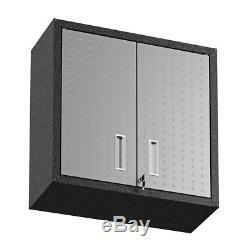 Fortress Floating Garage Cabinet - Set of 2. 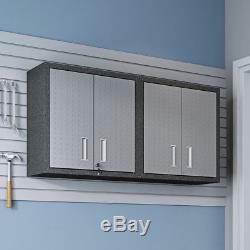 The Fortress Floating Garage Cabinet is a garage essential featuring one adjustable shelf and double doors, perfect for stashing tools and accessories. 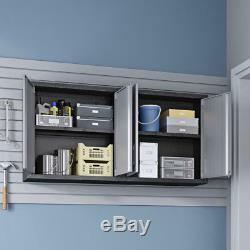 Durable and built to last, the cabinet includes wall brackets for added safety and a door lock and key to help keep items secure and detract from tarnishing. 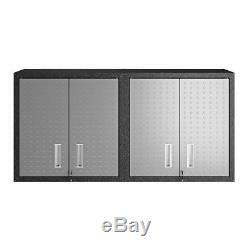 Manhattan Comfort Fortress 30 Floating Textured Metal Garage Cabinet with Adjustable Shelves in Grey - Set of 2. 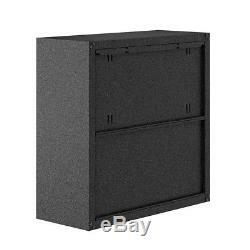 Floating Diamond Shape Textured Wall Garage Cabinet. Upon Assembly, Measures : 30 in. 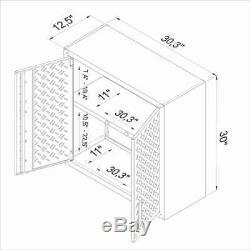 Includes 2 Doors and 1 Adjustable Shelf. Features Unique Door Lock and Key. Wall Brackets Included for Product Durability. 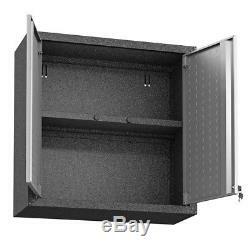 Set of 2 Floating Garage Storage Compartments. Arms (Min -Max Height from Floor) : X. Door Type : Pivot Door Hinge. Frame Material : Gauge 25 - Carbon Steel. If your tracking information shows your package as delivered, but you do not have it yet, please be sure to check with your neighbors to see if it was delivered to them. However, we do process orders very quickly and after it is processed unfortunately there is no way to cancel it. Typographical Errors In the event a product is listed at an incorrect price due to typographical error or error in pricing information received from our suppliers, we reserve the right to refuse or cancel any orders placed for product listed at the incorrect or erroneous price, or request return or disposal of any invalid product received at the discretion of OJCommerce on a case by case basis. Please note, custom or special request orders are not returnable. This will be clearly marked on the product's sale page. Non-returnable items: - Assembled and/or modified items. Additionally; here are instructions to expedite the return on your own: Here's how: 1. Locate the item and select Return this item from the More actions drop down menu 3. Select the reason to return this item and include a message 4. This will better assist us in tracking any issues that might occur during transit. If Your Order/Part/Carton cannot be located, is not delivered or is Lost: In the unfortunate instance that your product cannot be located, is not delivered to your address, or is lost in transit please contact our customer service department and an investigation will be processed. If the item is not located a replacement item or part will be issued following completion of the investigation by the carrier. If Your Order Arrives Damaged or Missing Parts: In the unfortunate instance that your product arrives damaged or missing parts (cartons), contact our Customer Service Department within 48 hours of receipt of the item for replacement parts or a full replacement. Damaged or Missing Parts orders receive replacement parts or full replacements with no additional cost to our customers. Requests for full or partial credits are not available. In most cases, we may require you to take digital images (photos) of damages to the product and carton(s). As well as additional information to process your request such as part number, item codes, etc. In some cases, we may ask you to take digital images of damages. Before, during, and after assembly of your order, further inspect the item and report any issues to our Customer Service Department immediately. Also, do not discard the item's boxes, as they are needed to properly return your item. Typographical Errors In the event a product is listed at an incorrect price due to typographical error or error in pricing information received from our suppliers, we reserve the right to refuse or cancel any orders placed for product listed at the incorrect or erroneous price or request return, donation or disposal of any invalid product received at the discretion of OJCommerce on a case by case basis. Non-Returnable Items - Assembled and/or modified items. Our goal is to make it easy to do business with us. We work closely with consumers, students, athletic directors, coaches and physical education teachers to ensure the best possible online shopping experience. With this in mind, we offer an unconditional 100% satisfaction guarantee. At OJCommerce, we are totally committed to your satisfaction. Have questions, need advice or customer service support? Our knowledgeable customer service associates are here to here to help. You may also be interested in.. 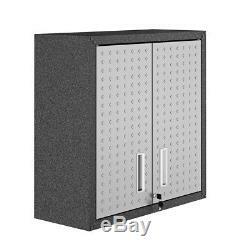 The item "Fortress Floating Garage Cabinet Set of 2" is in sale since Monday, November 26, 2018. 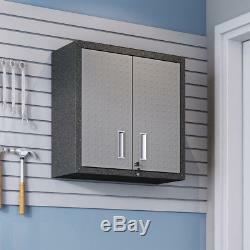 This item is in the category "Home & Garden\Household Supplies & Cleaning\Home Organization\Other Home Organization". The seller is "ojcommerce" and is located in USA. This item can be shipped to United States. Upon Assembly, Measures: 30 in.